One thing that is vital for us at Mozilla is to listen to developers and users, and care to your needs to make the web a better place. We’re strong believers in constructive communication and discussions, and that’s why I’m happy to announce our latest initiative! Feedback channels for developers. We’ve been looking into various ways to make it as easy as possible for developers to express their thoughts and opinions on a number of topics, and also for how we at Mozilla can be as transparent as possible around the projects we work on. Making the web a better place isn’t only about trying to figure out what’s right – it’s about listening to people, gather their thoughts and ideas and let that help us in achieving better results. With that in mind, we’ve been evaluating third party services available as well as our own projects such as Mozilla Support and Firefox Input. For this specific use case and to match our requirements, we’ve decided to do it through the UserVoice service. We want to make it dead simple for you to enter ideas and vote for existing ones, both through an easy and intuitive user interface but also with requiring no account registration. Currently all you need to do know is enter a name and an e-mail address and you’re good to go! You will also have 10 votes dedicated to your e-mail address/account, which you can dispose as you seem fit for other ideas there. Naturally, if we see an abuse of this simplicity, we will have to add an element of moderation to process. We sincerely hope that won’t be needed, though, and that you will act and write respectfully. 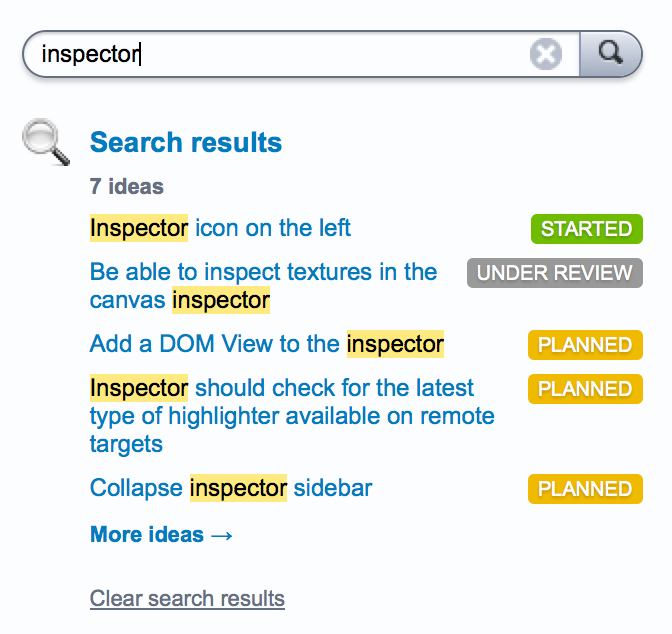 The first project out the door that we will have a feedback channel for is the Developer Tools in Firefox. We have made great great progress with the Developer Tools over the last year – outlined in more detail in Dev Tools articles here on Hacks and the extensive documentation on MDN – but we want to hear the ideas you have to make them even better, what’s important to you, what could be a game changer and much more. People from the Developer Tools team will interact directly with you in this feedback channel, giving you a unique opportunity to influence and inspire us, resulting in a better product for you. This try with UserVoice and feedback channels is our first attempt at this, with the ambition to be able to listen to your thoughts and ideas, and utilize that to make sure we focus on the most important areas. If we see that we can make a difference with this initiative and that you appreciate the direct contact and transparency, we will do our best to keep this going and to introduce channels for more topics in the future! Will you automatically implement the feature with the highest votes? Not automatically. The voting and ideas will help us see what you truly care about and interact with you around those, but we will also need to compare developing time and resources vs. the possible gain we see for a certain feature. It will however be of immense help for us weighing ideas, features and items in the roadmap against each other, and a helpful tool for prioritizing our work. Here are the most common things you can do at UserVoice – what they are and what they look like. You can easily view a list of ideas, the number of votes they’ve gotten, current state (e.g. Started, Under Review), click the link to see comments and more. 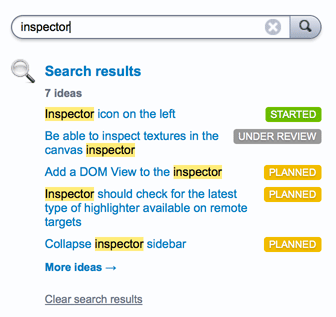 You also have a quick navigation to sort the listing based on what’s Hot, Top ideas, New or their current status. You can also list them based on your feedback or comments as well. When you start typing, you will get suggestions for existing ideas that might match your topic, highlighting the word(s)in question. Please make sure to vote for existing ideas instead of creating duplicate ones. In the right-hand side of the web site, you can also quickly search through existing topics and ideas, and see both matches and their current state. It also gives us the possibility to give you a reply to the state of the current feature. Whether it’s already in there, planned or if there’s something that’s not currently on our roadmap. For reporting bugs, go to Bugzilla. We really hope you will like this opportunity to have a discussion with us and be able to influence our thinking and work! If this works out well, we’d be glad to take it to other areas as well. So help us help you! Let’s work together to make a better web with better products for developing for it. 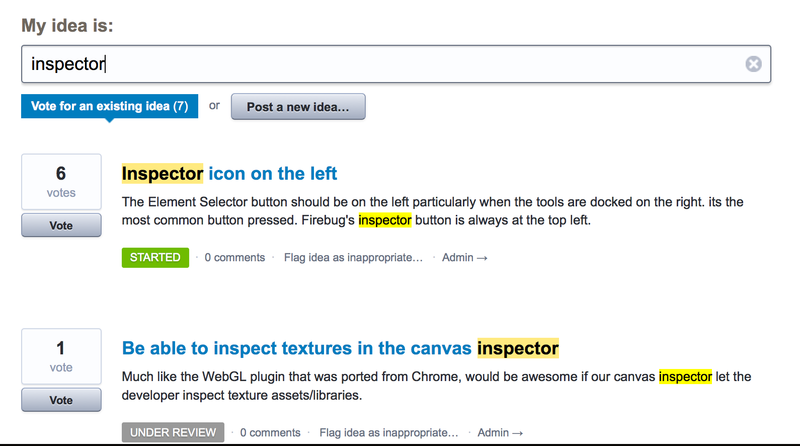 Go to our Developer Tools feedback channel and get started! An easy to find Task Manager of Firefox would be fine so that we could know what addons are using a lot of memory. 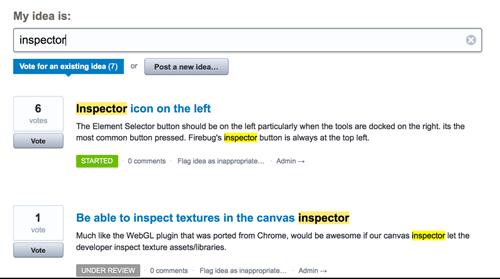 Please add your thoughts in the Firefox Developer Tools feedback channel. Work on looking at memory monitoring have started. Not very constructive, optimal or based on the current situation. Please read Firefox Developer Tools and Firebug for more information.